I was cringing during the whole Jane Goodall interview. 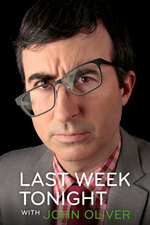 That was the first thing in this series that felt copy/pasted from The Daily Show, and though I loved John Oliver's interviews on TDS, on his new show he's kind of got a voice of more authority (while still being funny) that it came off as mean. Especially being Jane Goodall, who is like as close to a living saint as we have, having to suffer dumb interview jokes. I dunno, I think it might work better if it wasn't John doing the interview, if they could farm it out to one of the writing staff to do the goofy interviews. Otherwise, an excellent show as always, the FDA thing was eye-opening. I think I can see where you're coming from on that. She handled it with good humor, and indeed, I'm certain she was in on the joke from the first. But it did seem a bit harsh. My guess (definitely a guess, I have no inside knowledge) is that they prerecorded a number of these Daily Show-style interviews ahead of time to use in emergencies, when a major piece doesn't come together in time, and that's what happened here, a piece they were working on couldn't get finished by air time, and so they slotted in one of their failsafe bits. She has been on The Colbert Report as well so she must know what's up. It didn't come across as mean but it did seem out of place for his show. In fact, it seemed more like a Colbert interview than anything John Oliver has done even on The Daily Show. His stuff there would at least be political with a point, where as "buffoon interviews celebrity" is totally Colbert's gimmick at this point. The interview segments are routinely the weakest part of TDS/TCR and I'd like to see them not mess up LWT. I really, really, really hope interviews don't creep into this show and become a regular thing. It breaks the format utterly, and turns it into just another Daily Show. Like JHarris, I wonder -- in horror -- if they might have a few interviews with similarly non-topical subjects already in the can for those rare occasions when they don't have enough material and need to fill time. It'd be a good idea to have some filler, but the show would be more cohesive if it stuck to the "How is this a thing? "-type segments that are an established part of the programme. Ugh, I agree with everyone regarding the interview. While the rest of the show does a decent-to-great job covering current events and news-worthy topics in an in-depth and interesting way, with a good balance of humor and seriousness, the interview just felt like a shallow throw-back to 1999-era TDS, with interviewers mocking their interviewees (I distinctly remember them interviewing someone who thought Pez or Pez dispensors would be a post Y2K currency, and the interviewer asking something like "do you prefer the term 'idiot' or 'moron,' and the interviewee walking away). It wasn't that bad, but clearly Jane Goodall was not amused by a number of the silly questions, which seemed like they really wasted her time, which really cheapened the show for me. But I was kind of skeptical of the humor starting when John said that the good looking doctor with ebola whose significant other was promoted from "girlfriend" to "fiancee" was clearly marriage-worthy material and "you've got to lock that down! YOU HAVE GOT TO LOCK THAT DOWN!"